Even though I tried to put them mostly in order, I have to say that I didn't dislike a single one of the beers on that list. Even the ones near the bottom were really good; one reason I might have ranked them lower was if they missed the green flavor I wanted. A good example is the Fest of Fury, which is a delicious malty brew -- really stellar, but with only a hint of the fresh hop aroma. After my disappointment with the first batch of Lupulin to come out, I was really happy to try the other two batches and find that they almost got me back to that happy place I was last year with the Amarillo-hopped Lupulin. Hop Trip fell a little in my estimation this year, mainly because the rest of the competition was so good. For example, I really slammed Bridgeport in 2007 because the hoppiness drowned out the freshness, but I feel like they got it right this year. The Lucky Lab also got it right with the Mutt this year: it tastes much better than last year's. It's an amazingly mild 3.2% ABV -- that's even lower than Oklahoma/Utah 3.2%, which is ABW (about 4% ABV) -- but the fresh flavor shines through. The flyer describing it at the bar mentions that it was brewed with 45 pounds of fresh hops, but the hop-gleaning party supposedly yielded 125 pounds. Hopefully that means that there are three batches of it made up and ready to drink. The Widmer and Laurelwood 2008 offerings tasted better to me also. Widmer's uses an experimental new hop with supposedly 0% bitter alpha acids, though I thought it was nicely bitter. New Old Lompoc didn't brew Star of India -- which I thought was really good last year -- but they did a great job with the Fresh Hop Red. It's very similar to last year's Harvest Man -- I think they're both based on their Proletariat Red -- but with a more prominent fresh hop flavor. Even with that head start, there are a lot of beers on the list that I can't wait to try, like Ninkasi, Double Mountain, Pelican, and the fresh-hopped pale from Hopworks. The Tastival will be a great time, don't miss it! Having only recently gotten over my heartsickness for Portland, this post reminds me of that fabulous trip all over again. Ya'll really take your beer seriously! I love it! 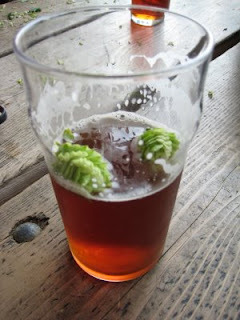 Request: a post about your description of various types of hops. Po: I'm not all that far along in my hop knowledge. Or any kind of knowledge. Fortunately, Jeff at Beervana has done the hard work. Check out his Hop Cheat Sheet. Thanks! That's a pretty cool site in general. Beervana, indeed!